It is every parent’s dream to see their children grow up to be successful people in life. Some parents don’t mind the struggle they face every day as long as its another step towards realising that dream. That is exactly the case for Anitelea Simone, 36-years old from Tulaele. He sells pork buns from Monday to Saturday. He sells more than eighty pork buns a day. “It’s hard because I’m the only one in the family who works and provides for my wife and children,” he said. Anitelea wants his children to get a good education. Anitelea’s job requires him to be fit. 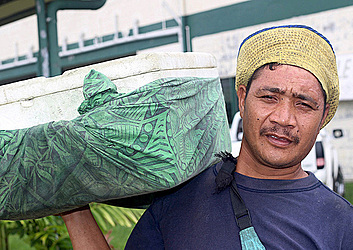 He walks from Vailoa Faleata to Vaitele to sell his pork buns. Rain or shine, he is at work. Village and Church donations cost Anitelea and his family lots of money.